Have you ever noticed an unpleasant odor in your kitchen? Even when you do your best to maintain a sparkling home every day? You may realize after cleaning every inch, including your fridge and trash bins, that this pesky smell is coming from your sink drains or garbage disposal. Thankfully, I’ve got easy steps to get rid of the smell and keep your kitchen fresh. Try among these steps, combat the foul smell, and win! Get rid of sink smell! Start with a simple way. Pour hot water down a drain or garbage disposal to remove leftover rotten food. It’s better to add a little of dish soap. Flushing soapy water has enough power to get rid of smells. It helps a lot, surprisingly. Don’t throw away citrus peels after you eat citrus. Citrus peels, especially lemon rinds, can be a useful odor eliminator. Put citrus peels down the sink and run garbage disposal. Citric acid will help the odor out of the sink without artificial chemicals. Put the combination of ice cubes and salt or lemon or both into a garbage disposal. The ice cubes will clean up garbage disposal blades so that it grinds food residue. Coarse salt scrubs the sides. Ground lemon acts as a natural fresh kitchen fragrance. The acidity of vinegar can remove sticky food leftover. It’s scent cover bad smells from inside the sink. Pour some vinegar down. Or add vinegar to boiling water and let them rinse garbage disposal or sink drain slowly. Baking soda absorbs kitchen sink smell. 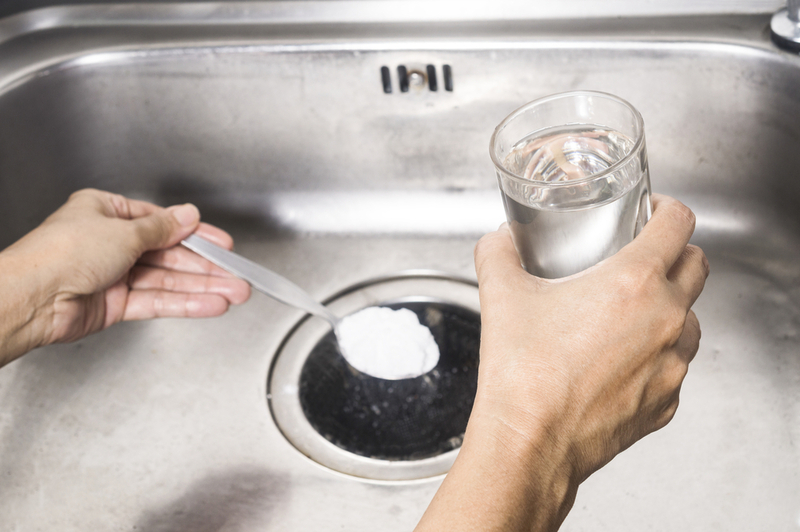 Pouring some baking soda into garbage disposal or drain makes stinky smells go out. You can combine baking soda and upper steps’ ingredients for more powerful action. Vinegar and baking soda mix with hot water or soapy water with baking soda will be effective.